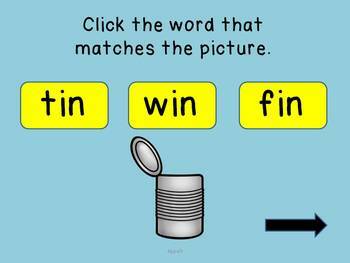 This is a powerpoint game in which students see a picture in the IN word family and click on the correct word out of three choices. The game is self-correcting because if they click on an incorrect answer, it disappears and leaves the other choices. This could also be used as a group activity by using the projector or smartboard. Students click on an arrow to move through the slides. 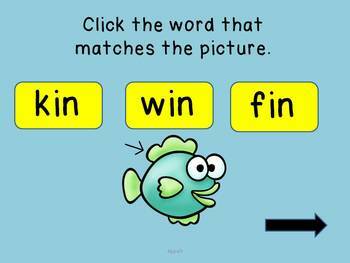 Kids will like the colorful graphics and watching colors flash when they choose the correct answer. 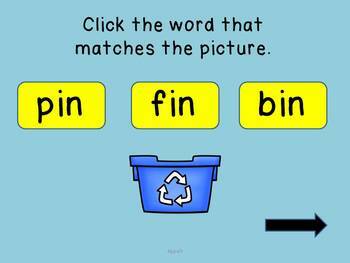 Great for learning new vocabulary as well as CVC word blending and recognition. This corresponds with my IN word family spelling worksheet and reading worksheet.